Thanksgiving is always a special time and here are some fun ideas to help make that special occasion a memorable one! Celebrate Express has some great party supplies for Halloween. I wouldn't hesitate to buy from them, I have seen first hand the quality of the products. Another high quality decorations option is from Paper Source Paper Source We just recieveed the Paper Source Keen Halloween Creatures and the girls are extremely excited to make them. Looking for a costume? Find Halloween Costumes at BuyCostumes.com. Amazon also has some great options. You can find solid color Black, Green, Orange and Purple Plates, Bowls, Cups, Napkins and Cutlery at Celebrate Express , WalMart or The Dollar Tree. You can find personalized options for invitations on Etsy or eBay. Pencils, Erasers and Small plastic spiders can all be found for $1 at WalMart and Dollar Tree. 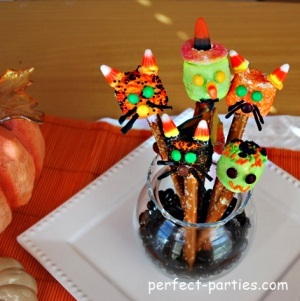 Great inexpensive alternative to candy. 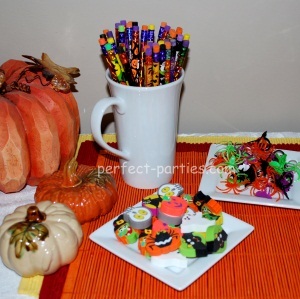 Cute plastic Halloween buckets to decorate or put party favors in. Chinese style take out boxes or even orange, black, purple or green paper bags for to make favor boxes. 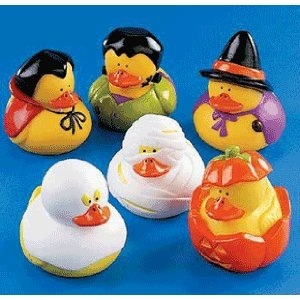 Play Duck Pond using these Halloween Rubber Ducks Here are more details for this Party Game. These also make cute favors or party decorations. Pinatas are always fun and it's a great time of year to get lots of different types of goodies and small prizes to fill a pinata with.